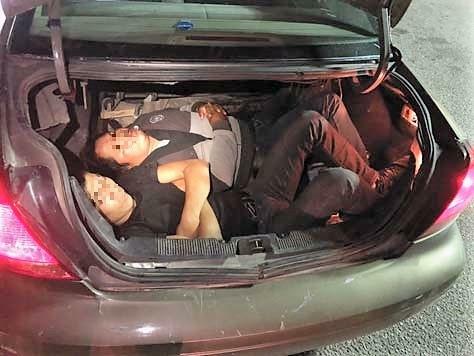 TUCSON, Ariz. – Nogales Border Patrol agents arrested a 22-year-old Tucson woman after finding two male Mexican nationals hiding in the trunk of her vehicle Monday night at the Intestate 19 Immigration Checkpoint near Amado. Agents working the primary inspection lane referred the woman for a secondary inspection of her Ford Taurus. When agents opened the vehicle’s trunk, they discovered the two men inside, ages 21 and 24. Agents arrested the driver, identified as a U.S. citizen, for human smuggling and seized the vehicle. The Mexican nationals were processed for immigration violations.